Eggs are an excellent nutrient-dense food that packs six grams of protein, a bit of vitamin B-12, vitamin E, riboflavin, folic acid, calcium, zinc, iron, and essential fatty acids into a mere 75 calories. Second to the lactalbumin protein in human milk, eggs have the highest quality protein of any food. In addition to being good for the body, eggs can be prepared in a variety of tasty ways. We’ve often heard or read that eggs are bad for the heart because they contain a lot of cholesterol. Not necessarily! The nutritional logic that gave good eggs a bad rap goes something like this. Foods high in cholesterol are bad for the heart. Eggs are high in cholesterol. Therefore, eggs are bad for the heart. To show you how unfair it is to implicate the egg in cholesterol problems, consider that an egg contains only two grams of saturated fat and 75 calories versus seven grams of saturated fat and 268 calories in a small (3.5 ounce), lean hamburger patty. Even though a hamburger may contain only 100 grams of cholesterol as compared with 210 grams in one large egg, most quarter-pound hamburgers contain four times as much saturated fat as the innocent egg. Eggs actually qualify for the “low in saturated fat” label. If the American Heart Association is not concerned about the cholesterol in eggs, neither should you. In light of the recent evidence clearing cholesterol as a heart-unhealthy food, the American Heart Association changed its tune and now regards an egg every other day as acceptable for people with normal cholesterol and those who are not sensitive to dietary cholesterol. Now that the egg has been found “not guilty” as a cholesterol-raising food, scramble it up and enjoy. Want more nutritious eggs in your diet? Find out what the hen was fed. In fact, research has proven that better chicken feed results in better eggs. Free-range hens allowed to forage on barnyard plant food produce eggs that are lower in cholesterol than commercially-fed caged hens. Studies comparing eggs from the average hen-laying factory with those of free-range chickens fed diets high in essential fatty acids showed the chicken on a healthier diet produced eggs higher in the heart-healthy omega-3 fatty acids. Studies are under way to produce what are dubbed “designer eggs,” eggs in which the fatty acid profile of the egg yolk has been modified by altering the hen’s diet. In an interesting experiment, giving hens feed rich in flax seed and fish oil (with their omega 3 fatty acids) increased the amount of omega 3 fatty acids in their eggs, producing “omega eggs.” So, even when it comes to chickens, “you are what you eat.” Egg consumers are not used to asking their market managers how the hens were fed that laid their eggs. Yet, if enough consumers start asking the question egg buyers would start putting feed information on the labels. The egg of the future will only be as healthy as the consumer demands. Give each egg a check-up before purchasing. Examine the egg for cracks. Turn the egg over in the carton. If any eggs are stuck to the bottom of the carton, suspect cracks. Don’t wash eggs before storing them. Washing may remove the invisible protective coating surrounding the shell, allowing bacteria to enter. Store eggs in the refrigerator in their original carton. This not only keeps the eggs from absorbing the aroma of other foods, it also keeps them out of those convenient little egg holders on the refrigerator door, where they don’t belong. Door storage is too warm. (It works for butter, but not for eggs.) Storing them in the carton also keeps the eggs from absorbing the aroma of other foods. Wash hands (and utensils) thoroughly after handling raw eggs. Cook eggs thoroughly. To kill the bacteria, fry an egg for three minutes per side, five minutes total for a poached egg, and seven minutes for a boiled egg. Cook until both yolk and egg white are firm. Scramble eggs until they’re no longer runny. Sunny-side up eggs with runny yolks are risky. Commercial egg products, such as eggnog, have been pasteurized and are therefore, at least theoretically, safe. Don’t use raw eggs in recipes made at home. 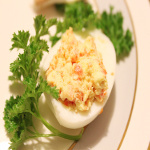 Keep eggs and egg-containing foods refrigerated and avoid letting them set at room temperature for more than an hour. If you’re mixing raw eggs into recipes, such as cookie dough, avoid the temptation to let your child lick the bowl. Because eggs are high in cholesterol, they have been lumped together with meat as nutritional no-nos. Wrong! Studies show that for most people who do not already have high cholesterol or who are not particularly sensitive to dietary cholesterol, consuming an egg a day does not significantly elevate serum cholesterol. Most nutrition experts suggest that one egg three times a week can be part of a healthful diet.